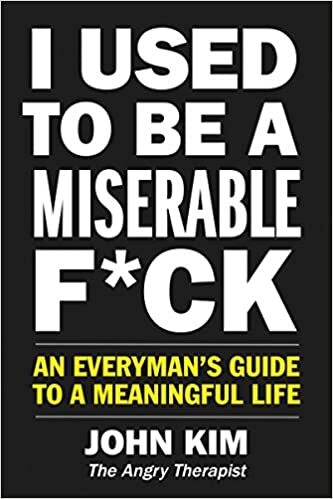 The New Year is still a few months ago, but we offer you some of the finest advice we can: Get ready for I Used to be a Miserable F: An Everyman’s Guide to a Meaningful Life (HarperOne, $24.99). John Kim’s book will be released on January 29, 2019 . . . and we promise you must save the date! Deep in post-divorce soul searching, Kim realized he might be to blame for the problems in his life. In other words, he was a miserable F. So he created a blog called The Angry Therapist, nodding to the fact that while he was a licensed therapist and life coach, he was no better than the people coming to him for advice. In his first post he wrote about the struggles and shortcomings that had led him to this point. As his work caught on and catapulted him into the role of unlikely and unconventional guide for thousands of people all over the world, he evolved from acting like a boy to living like a man–and showed his clients how to do so alongside him.